Magical Clothes Hanger-Buy more save more!! The Magical Clothes Hanger is your answer! 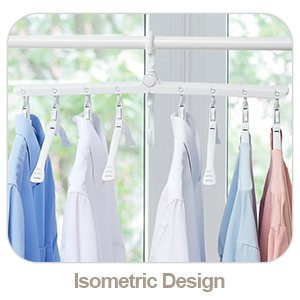 This is a magic hanger that can save more spaces for your closet system, and it is an expert in clothes classification as well! Unique Design: made of new high quality PP material, it can be bent without deformation and will not break.And no need for professional use, 8 wide shoulder hangers together, 2 classic suspension mode to save space, perfect and quickly complete your drying and storage work. Sturdy and durable：Each sturdy hanger can hold up to 30 lbs -- thats up to 8 heavy winter coats. Great for the dorm, apartment and seasonal storage. 4X Space Saving than normal hangers keep your clothes neat and tidy in your bedroom closet.Organizing your closet has never been easier or faster than with the mytour hangers! The only question you'll ask is what to do with all that new-found space you've created! 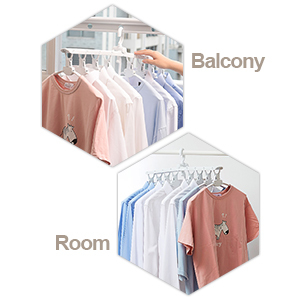 Unique rotation storage design, make you don’t need to remove clothes from hangers for storage, You can storage your clothes from balcony to room directly, Saving much your time.